Most people worry that their car might get broken into but a lot of people make some common mistakes that makes their vehicle more likely to be targeted by thieves. To help you cut down the risk of car theft, below are some excellent tips to follow. This is a very common mistake that people make and is a huge reason why vehicles get broken into. Most thieves are opportunists and often they don’t actually want to steal the car itself but rather any valuable contents inside. Leaving expensive items such as a phone, tablet, laptop etc. on display while you’re away from your car is just asking for trouble. You should always put any valuables out of sight – either in the glove box or boot of your car if you’re not taking them with you. Many cars are stolen by thieves who hook the keys through the letterbox. Most people don’t even think about this possibility when they leave their keys on a table near the front door but it’s a lot more common than you’d think. Always be sure to put your car keys well away from your front door and ideally out of sight completely. Parking your car securely is extremely important, when you’re at home and when travelling. Ideally you’ll have a garage to keep your car in when at home as this is the safest option by far. 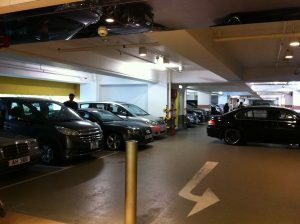 When you’re travelling and need to park, you should always look for a secure indoor carpark. 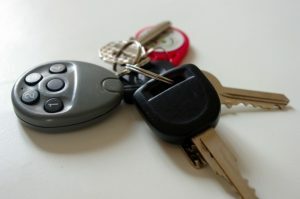 There are mixed opinions on steering wheel locks and although there are no solid stats to back up their efficacy, there is a lot of anecdotal evidence from people in the know that they are actually effective. Some people are put off using them because of the extra effort required to fit them when parking. However the added peace of mind that they provide is worth the effort. Usually the sight of a steering wheel lock will be enough to put any thieves off. Getting a comprehensive insurance policy that covers your vehicle for theft and vandalism is one of the best ways to protect yourself. It will not reduce the likelihood of your vehicle being stolen but it will ensure that you’re fully compensated if it is. If you have had a conviction and find that getting insurance from a mainstream provider for an affordable price is difficult then check out convictioninsure.co.uk You can get quotes from convicted drivers insurance specialists in a very easy manner.